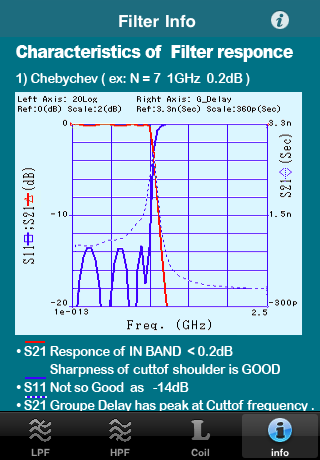 Please check SDOTECK Blog about Hign Power RF Amplifier . SUDOTECK released applicationFIL Calc for iOS. 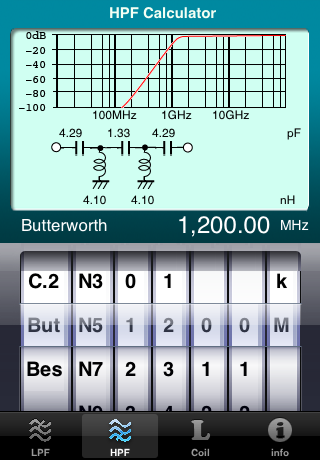 This application has four calculation functions for RF Engeneer . Picker Wheel Data setting interface is very simple for all functions . When you want to design LPF ,set the kind of filters using left wheel . [C1.] ... chebychev filter of ripple 1dB MAX . 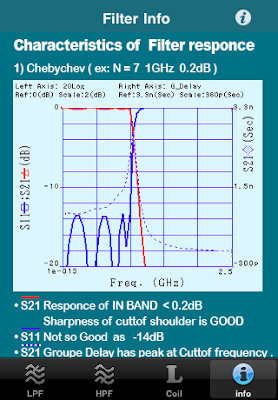 [C.5] ... chebychev filter of ripple 0.5dB MAX . 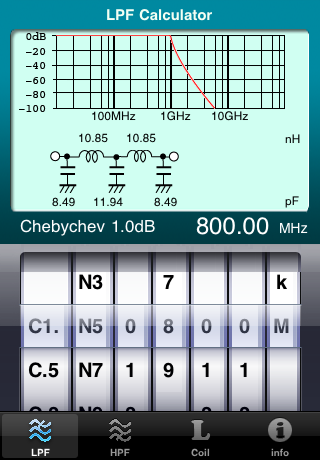 [C.2] ... chebychev filter of ripple 0.2dB MAX . [But] ... Butterworth filter . [Bes] ... Bessel filter . And next whel select Number of components . Cut-off frequency is set with numeric 4 wheels and "KHz" , " MHz" wheel . An ideal characteristic is displayed on the screen. And calculated value will displayed ata each components . When you want to design HPF ,set the kind of filters using left wheel . To developing filter circuits , you will often need to make some coils . The Air Coil is used for many filters . 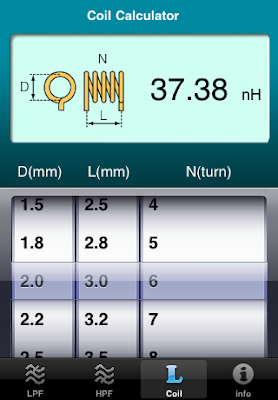 You can calculate the value of coil using [D]iameter wheel and [L]ength and [N] turn of coil ..
Info TAB will show you the responce of each kind of filters ,S11,S21 and groupe delay . Tap [i] button , you can jump File calc support WEB .